The Bing Maps Routing and Traffic Team is constantly working to make navigation and route planning easier! 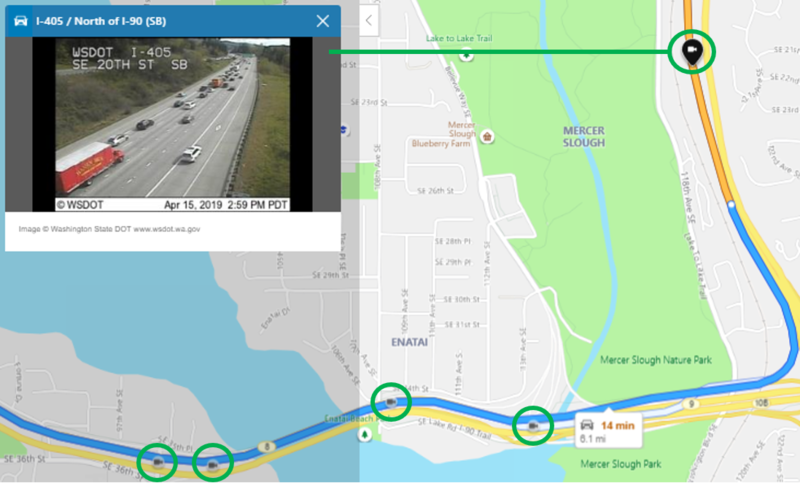 Hot on the heels of our previous announcement about traffic coloring, the Bing Maps team is proud to announce that we have made it possible for users to access traffic camera images along a planned driving route! You can now see traffic camera icons along a short to moderate-length route. By clicking on a traffic camera icon, you can view the latest image from the traffic camera at that location. In the example below, the orange colored segment of the route indicates that traffic on I-405 South is starting to get backed up. With traffic camera images now available, you can confirm local traffic conditions with just a click of the camera icon along the route. Gaining access to the traffic camera imagery not only helps with checking for traffic, accidents and general navigation, but can be invaluable to users when traversing areas impacted by extreme weather conditions, such as heavy snowfall, wind storms, flooding, etc. Getting to and from the resort for your annual ski trip can become both challenging and dangerous when the roads are covered with snow and ice. This past February, Washington state was hit with unprecedented snowfall. Many sections of road near the Snoqualmie Pass were rendered impassible because of record amounts of snow, resulting in motorists getting stuck and stranded. With traffic camera images now accessible along the route, you can quickly check for dangerous road conditions before heading out. In the example below, it snowed throughout the day at Alpental on April 13. The traffic camera image shows that the road was clear and safe for driving at 5:48 PM despite the snowfall. Getting a look at the road ahead can help you avoid heavy traffic and tricky road conditions, so be sure to check out the “traffic” option with camera imagery on Bing Maps when you are routing your next trip at https://www.bing.com/maps/. Bing Maps Is Full of Stars.